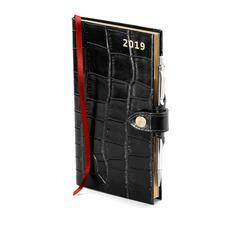 Leather Diaries from Aspinal of London are individually handmade in England in our own workshops by genuine leather and bookbinding master craftsmen and women. 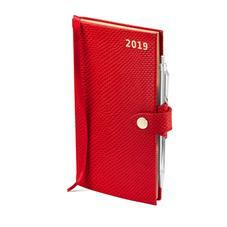 Each diary is made using only the best hand-dyed and hand waxed leather and age-old traditional bookbinding skills handed down through the generations. The Aspinal Slim Pocket Leather Diary & Pen Collection is an essential accessory for yearlong style and organisation. Even in this age of smart phones like the iPhone and BlackBerry, you still can't go wrong with a quality traditional leather bound diary. All of our Leather Pocket Diaries can be personalised with up to 4 initials.